And it’s time to turn up the volume on our Keep Palm & Posh On project! Brett & I had the opportunity to visit Coatapeque, Guatemala last December. Why the remote community? Because it’s home to our good friends and growers AgroAmerica where they produce sustainable sourced palm oil for the amazing Chunks you LOVE to lather up with! While there, we learned about just how much this grower does for this remote community. In a place where there’s little indoor plumbing, little education, medical care, nutritional awareness we saw an opportunity to do a little good for our friends. This is the mothers and children healthcare clinic in Coatapeque where moms and their babies line up each day to get valuable (and free) healthcare and nutrition. With an unstable national infrastructure, businesses like AgroAmerica don’t get to just do business, they also invest in caring for the people in the communities in the area that work for their business. They provide jobs for men and women (which isn’t always easy to find in remote Guatemala!). They built and maintain the schools, and feed the local kids. For the young mothers (oftentimes, girls marry at just 15 or 16 and have babies long before their 20s), the Bolanos brothers who own AgroAmerica also provide a medical clinic in the town. The infant formula SIMILAC is used at the clinic to supplement the diets of all babies under 4 years of age who visit the AgroAmerica health clinic. Proper nutrition sets them up for a better life in their remote area of Guatemala. This clinic is home to dozens of volunteers from the USA who help care for and educate moms and their babies. We had the opportunity to visit and meet these clinicians and the local community they serve, and we found a chance to help. Please join us, now through Unconventional by collecting your spare change at events, parties, and from your wallet after you break a bill. We’d love to raise enough to provide the valuable infant formula SIMILAC to this clinic for an entire year … that’s why we’re asking for your change to make change for our little friends in Guatemala. In remote communities, the schools and healthcare provided by our growing partner are the difference between a life of opportunity and a life in poverty. FILL A CUP or JAR WITH CHANGE! We’d love you to focus on it in April for National Volunteer Month. We at home office are joining in the fun…. We’ve shared these fun cups on everyone’s desk and are competing to win! 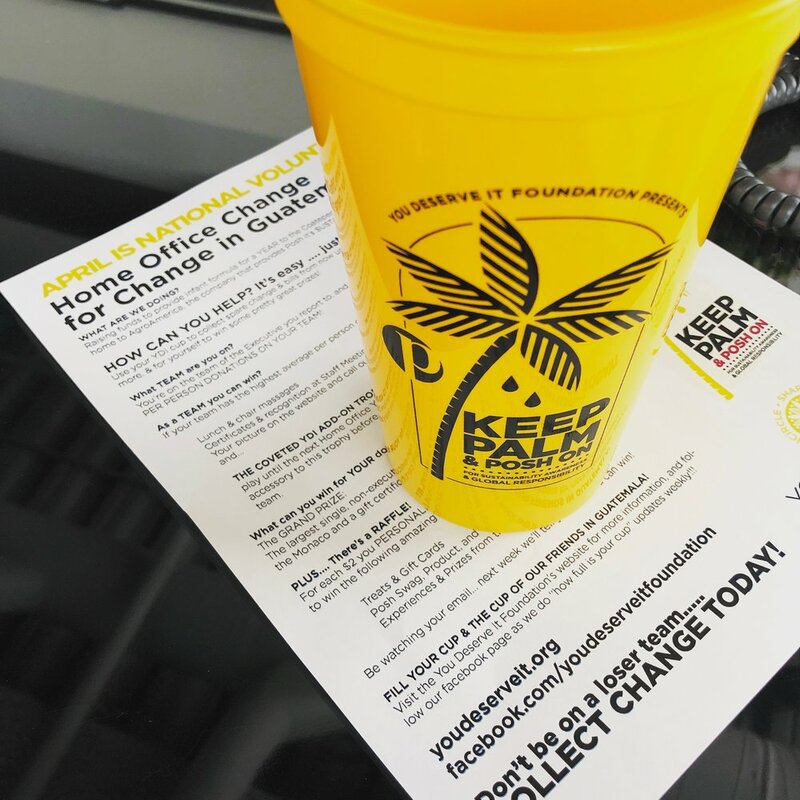 Won’t you put out your Keep Palm tote, a jar, or cup and help us do the same? This is the Home Office cup and challenge. What are YOU using to help collect change for change? On or before April 27, deposit the change you've collected and send it to the You Deserve It Foundation via the DONATE NOW button above, or at PayPal via brett@youdeserveit.org. Those contributing $100 or more by end of day April 27, will be honored at Day Away on May 1 and will be honored with a special gift (live or via Redeem Tab), name or team name will be shown on stage, and with an exclusive You Deserve It pin. Special gifts, mentions, and invitations to stage will be extended to the largest contributors.